Unique Lives and Experiences presents Chris Hadfield, this Sun., November 16 at the World Trade and Convention Centre. 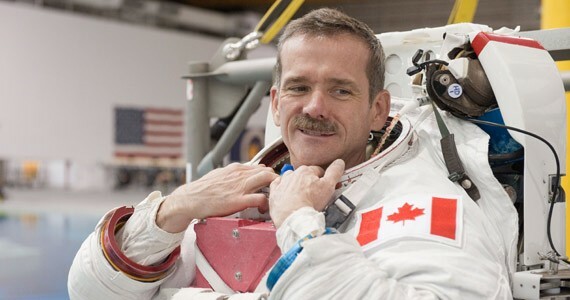 Canada's most famous astronaut, Chris Hadfield, captivated the world last year while orbiting high above it. The social media savvy of the International Space Station's commander gave the public a first-hand look at life in space. Now, the retired pilot and astronaut is visiting Halifax this weekend to speak about his unique experiences. Hadfield took time away from walking his dogs—a pug and a maltese—to chat with The Coast about his 35-year career and what comes next. You were just in Seattle, the week before that you were in Texas. 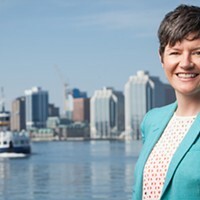 Now you're coming to Halifax. Your retirement seems more exhausting than your time as an astronaut. Well, no. Nobody knows how hard astronauts work. But, the second book is doing really well. It's a New York Times bestseller and the best selling book in Canada, which is really nice. Our profits go to the Canadian Red Cross, so it's really nice to see that level of success. But part of book selling of course is going and signing books in a bunch of locations. So I'm just doing that. That's how you get stuff done. I have no desire to do nothing. I've always been busy. Why wouldn't you be busy? What else are you going to do? You're always doing something. Why not do something productive or something you think is worthwhile. Your videos and social media interactions aboard the ISS really struck a chord with the public. Why do you think they were so popular? I served in the astronaut office with the Canadian Space Agency for 21 years, which is longer than just about anybody ever. Neil Armstrong was only an astronaut for eight years, total. He flew in space three times, walked on the moon. So, after 21 years, I'd spoken, I couldn't count the number of times. Probably thousands of times in schools across Canada, and businesses, and Parliament, the UN, really getting a sense of what's interesting to people. Through my whole 21 years, I did my best to try and answer that question. My first two flights—which were shuttle flights—were quite short and also quite busy with spacewalks and building Mir and such. There wasn't time for any sort of do overs. You could just get through things once and then you're home. So, on my third flight, working with the Canadian Space Agency, I really resolved to do my best to share it, given much more of a luxury of time. But probably the biggest difference was the improvement of technology. I could, rather than just record maybe what was happening in limited ways and then do my best to share it in the years that followed, I could share it real time, at high data rate. It was really just a straight continuation of what I've been doing for over 20 years, but it was just much better enabled by technology. The reaction was not really a surprise. I was very aware of the level of interest and the unusual nature of what I was up to. It was always just, kind of difficult to deliver on it real time. Where as, you know, going to speak at a school somewhere and putting up a 35 mm slideshow is not the same as talking to people directly from orbit, or having real-time communication. I had just resolved always to share the experience the best way that I could, and on my third space flight I had both the advantage of time and technology to make it more possible than ever. And the results were huge. It was really impressive, to see. Was there always the interest in space with the people you talked to, but it needed this high-data, mass-communication format? Well probably the gold standard example was the Apollo 11 moon landing. NASA had a whole smorgasbord of choices of how to let people know what they were up to during the moon landing, during Apollo 11. They chose to basically invent reality tv. They said no matter what happens here, we're going to broadcast it live; every single thing that happens. Whatever they say, whether they mess it up, whether they crash, whether they swear, we are sharing it with the world and then people can decide what they think. And they could have been easily forgiven to have just parsed it out—to have kept it and played back the highlights of it or whatever, like the Soviets. Instead, they opted for taking advantage of the technology to share a really unusual human experience in real time. It affected the lives of billions of people as a result, to a very small degree or a very large degree. So I think that probably answers your question. If you hear about something after it happened, and in a very measured way, it only has a limited impact on your understanding of it and your feeling of participation. Whereas, I mean, if you were there for the fall of the Berlin Wall, it's way different than if you woke up the next morning and saw a couple pictures in the paper about it. It's that level of the humanity of it that I think makes it more compelling. Exploring the universe in person is brand new in the human experience, and being able to share it real time; the evidence is pretty clear that that has a big impact on a lot more people than if you don't do it that way. Have any of your efforts been about any concerns the public might have with space and science? That some people think it's a waste of money. Some people think everything's a waste of money. Some people think the government's a waste of money. Some people think newspapers are a waste of money. I mean, I believe passionately in what I’m doing. I've spoken to literally millions of people and the level of interest is huge. I don't worry too much about, and I've yet to meet anybody who says “Why do we spend money on space travel when we could be spending it on something else?” who actually knows how much money we spend. It's an uninformed emotion, rather than anything that is factual. So I spend all my time trying to deal with the factual side; show people what we're actually doing and where it leads us, what the lessons learned are and the perspective that it gives us. And I've been doing it for 23 years. You've mentioned before that privatization is the future for space exploration. Have those opinions changed by the Virgin Galactic and Orbital Sciences disasters last week? No, of course not. I was a test pilot before, and I know better than most how difficult it is to do something new. When we talk of the edge of the envelope, somebody tested that vehicle out to the edge of that envelope. That's how we know where the edge is. When I served as a CF-18 pilot, and a test pilot with the RCAF and the US Air Force and the US Navy, I lost basically a good friend a year the whole time I was doing that. Because it's a dangerous job, testing vehicles. Aviation is a lot more mature than space flight, as far as the technology goes. So, it's not a surprise at all. If we thought we were going to somehow be able to explore the rest of the universe and have no risk, that's just an unfounded ignorance. But I don't have that. Think how many people crashed in early aviation testing, or in sailing. Look at the Franklin expedition, or all the very explorative expeditions that have happened in the past. Not everyone wants to stay at home and be safe. Some people want to push the edges of what we understand or how we see the world, and the edges of places we can live and things we know. They recognize, all of us, there's a risk with that. What happened last week, the timing was unusual in that two things happened in one week, but it's part of the business. It's kind of the difference between science fantasy and reality. There's this science fiction, science fantasy view that it's all easy and simple and guaranteed. But of course, it's none of those things. Arguably, you're probably the most famous face of science in Canada. Do you have any concerns about Canada's funding cuts to scientists or where Canada stands with its policies on science? Well I worked for the federal government for 35 years, and I never once was told what not to say. And I was kind of on the cutting edge the whole time. I was intercepting Soviet bombers off the coast. I was a test pilot, doing a lot of different testing, and then I was an astronaut for 21 years. I've done my absolute best through that whole time to let everybody know what we're up to; that we are spending the money wisely. But I don't want to comment on, and you also need to remember, I lived outside the country for the last 26 years. I've been back one year. So, I'm not the most informed person on subtle details of federal policy over the last decade—at least as far as it affects the things that were not what I was doing. I'm not informed enough to be able to do anything, or be able to tell you conclusively. If you ask about a specific issue, then I'll go look up the details and tell you what I think about it. But just generically, it's just kind of like making noise. And I don't want to add my voice to just noise. I want to be informed a bit about things I'm talking about. I think the openness of your efforts have drawn a lot of people in. You're very reachable, on Twitter, Reddit. Is there any difference between the Chris Hadfield that's in public and Chris Hadfield at home? I don't think so. I don't think I could maintain a facade like that. If you read my first book, that's who I am, and what's important to me. That book's a distillation of everything I've done to this point in life and trying to boil it down to what is useful out of all this; what's important? Why do you live the way you do? How do you conduct your life? How do you try and be useful? How do you try and contribute? How do you prioritize yourself? How do you deal with fear in your life? How do you be a good family member? That's kinda of trying to extract out of all the things I do what might be useful to other people. I think, I am who I am.